In this tutorial I show you the if statement, relational operators, logical operators, ternary operator and the switch statement. 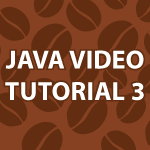 If you haven’t watched part 1 watch it first here Java Video Tutorial. As you watch this video, you will be able to follow it easier if you have the commented code in front of you. It follows the video below. While this tutorial has been slow it will get much more complicated quickly. So, make sure you understand everything I cover in the beginning. if possible, please add some videos for java frameworks(i.e Struct’s, spring etc.) in this java video tutorial series..
//doesnt work with single quotes. Why so? I have to just drop a comment to say thanks for these videos. They have taught me more in a month than I have learned from any book with the last year. I really appreciate that you go beyond the basics and cover enough material to help both a beginning programmer and an experienced programmer. I just made this stream of code to talk about what each of the conditionals do. I guess it just comes naturally to talk while writing the code? Talk it out … 🙂 works for me ! Great vid! I have more questions! Is it necessary to have a break; in the default case? Or any of the other cases for that matter? I’d assume it would continue to check the other cases and nothing would happen. Would having the switch do those unnecessary checks be something that would affect the performance of the program overall? Yes you don’t need the break and you are correct in regards to what would happen without it. The compiler is normally smart enough to handle any performance issues that come up depending on which conditional tools you use. Great video! I have question, a lot of people said that in order to become master in programming you have to practice coding a lot, and make a program. and I want to practice this, but I dont have any idea what to program, or what to build with the basic java that I have gained from your tutorial. I really want to improve my programming skill. Do you have any suggestion ? thank you! Thank you 🙂 You may benefit from watching my object oriented design tutorial. It covers how to turn a problem into finished code. You don’t have to completely understand the code. What is more important is understanding the mindset of programming. Feel free to ask more questions. Can you explain how does this represent numbers 1-49? I thought it would take a random number and multiply it by 50. Hi, really nice tutorials, still learning. I noticed that on this website code is a little bit weird, comments really don’t work the best, almost all code i green. Is it the website or is it a mistake? But still great work. Keep it up. Thank you 🙂 I’m not sure what you mean by the code is green. I’ll do my best to help. So, would I need papers, a calculator, and patience when coding? Java acts like a pet dog to you, and to me it is like deciphering binary 1’s and 0’s. Also, what can I do to practice? Any questions or practice problems somewhere?